Are these Bombshell Shorts not astounding? They are my new camp shorts knit for the Pour Moi Knitalong, hosted by Evelyn, and they're the most fun thing I've ever knit. Even when they were just sitting on my lap, unfinished- instant fun. And that's what this knitalong is all about: just a little something fun for me. 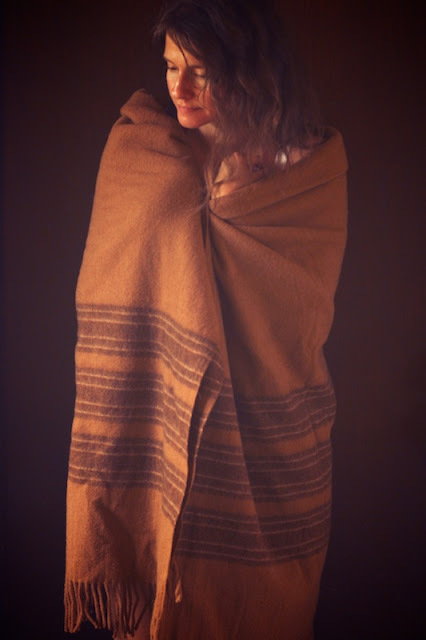 Here's me before I had them- just a normal housewife, huddled around a campfire, feeling lackluster, as though something were missing in my life. Then, I put them on and Bam! - I am finally fulfilled and able to realize my dream of becoming a breakdancing riot. I really didn't know how to look "fun" in these photos. Remember how I said I'm going to try to wear my handknits more? Well that applies to these too. Even though it's summer, I'll have the chance to enjoy these on vacation. Around a campfire or on a light hike were how I envisioned wearing these shorts in the first place. Now, I get to do it. 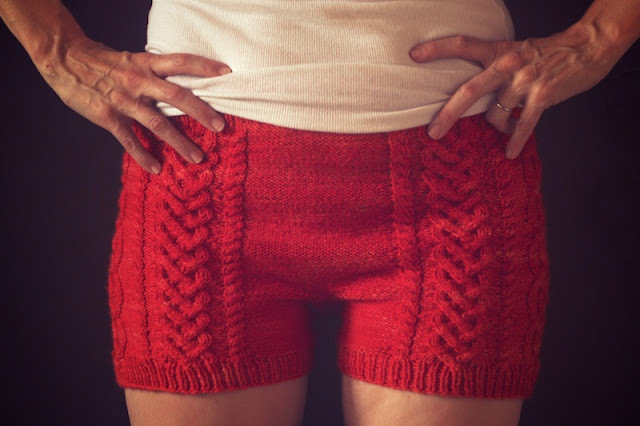 I loved Katie Canavan's design the minute I saw it in the Fall Holla Knits collection, but I had to get over the idea that knitted shorts might be unflattering. This is where my fellow Pour Moi knitters came in and said, "Do it!" Most women have shorter shorts in their closet, somewhere. It may be pjs or running shorts, but we're already wearing them, so why not handmade? I can honestly say the fit on these is no different than most of the shorts I wear to run or bike ride. They may even be a bit more forgiving. And after taking these photos, even though it was about 90 degrees outside, I did not want to take them off. They are that comfortable. I'm not going to pretend I'm not a little uncomfortable taking photos of myself in them, but this is how I'll most likely be wearing them this summer, messy hair and all. And it is the flesh-baring equivalent of what I just wore to run and walk my dog all over town this afternoon. So, yeah, fun, comfy, and they gave me a feeling of mastery. I felt like a knitting ninja after finishing these cables. To make a size medium, I used 1 skein of Knits in Class Fiber Studio's BFL DK yarn with size 0 needles. Yes, I did say size 0, but the pattern calls for a size 5. I didn't have 16" size 0s so I just used a really long circular for magic loop. I knit 26 rounds before joining the legs together, then 67 more once joined, before starting the waistband. That's 1 1/2 celtic cable repeats before joining, then 4 more afterward. 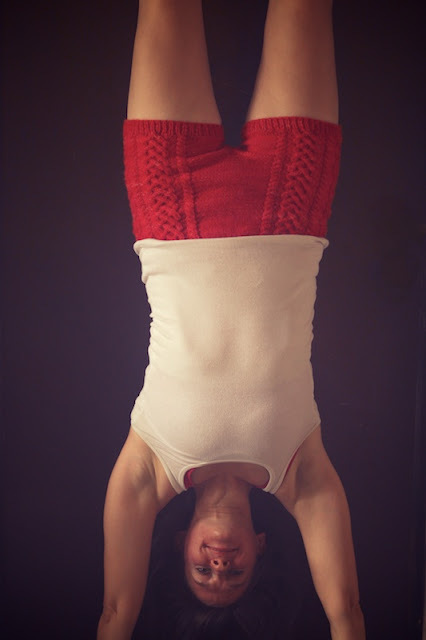 I actually knit them a bit longer than the shorter pattern sample I was using as inspiration. The actual pattern is written for longer shorts. Mine are just a bit shorter with a slightly lower waist. I did make one, small error on these. I read the spreadsheet chart from right to left like I would a cable chart. The only difference it made was to reverse the placement of my 4 stitch front and back cables on either side of the four rib braid cables. In other words, only a freak would ever notice that. I originally wanted to use elastic that was 1 inch or less in width, but our hobby shop had none. I used 1 1/4" elastic instead and it worked fine. This required 9 rounds of ribbing, 1 purl round, then 9 more of ribbing before binding off. The waistband, though knit at a very small gauge, looked like it would be way too big. But I trusted the pattern, and began whipstitching it. I whipstitched it around the elastic I was holding in place and, once finished, it was perfect. I also had trouble closing up the little gaps in the fabric at each end of the kitchener stitch used to close the crotch. It's the same problem I have on sweater armholes. So I undid the seam and used the same fix I use on sweaters, which Katie recommended. I picked up an extra stitch, where there would be a gap at the end, on each needle before using the kitchener stitch. After doing kitchener, I wove my yarn ends in in such a way that it sort of filled any gaping areas. I still haven't blocked them, but when I do it will help me even out any tight or loose stitches in the reverse stockinette. I can always block them out for a looser fit or more room in back. But I like them as is, they feel like really comfy knit boxers. I decided not to knit belt loops, though I may have had enough yarn to do it. I just didn't feel like I would ever wear these that way and I wanted a smooth waistband. All of this with one skein of yarn! 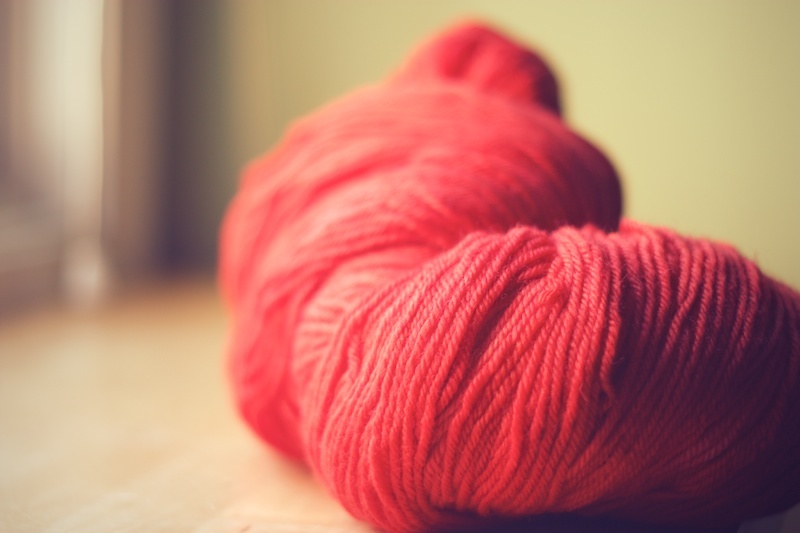 This is a great way to get into indie dyed yarns without having to buy a sweater's worth. I love the subtle tonal changes that keep the red from being too red. Like I said, fun! 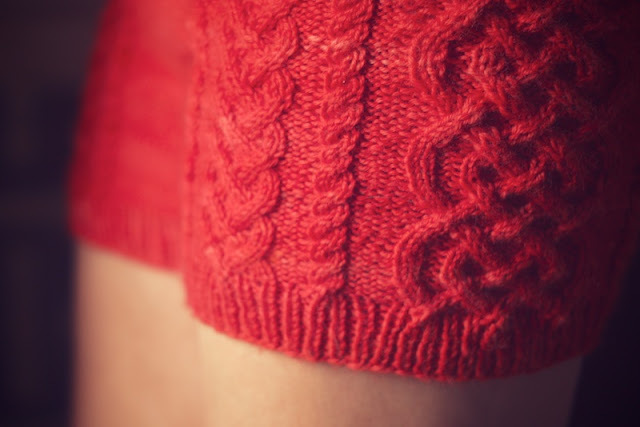 Other posts about the process of this knit in the Knitalong: Debating, swatching, the first leg, joining the legs, almost there, and a much abused pattern chart. So, there you go. All it takes is one skein of DK, a minimal time investment, and some encouraging knitalong friends (Thanks, Evelyn and the Project: Stash gang!) to lend a little courage, and you can go from Blah to Bam! too. Ok these look waaaaay better on you than the model in the pattern. You are rockin them girl! Thanks, Kelly! I just used the same yarn as featured in the pattern and it was the perfect amount and shade. They are sooo comfortable I may make another pair... one day. Those shorts are so pretty, and they look amazing on you! I bet I'd feel like dancing too if I were wearing such awesome shorts. I will, Vanessa! Hope your having a wonderful long weekend! Oh, thanks, Julie. They are an awesome design. I love how many ways they can be customized for fit- low/high waist, shaping or straight, belt loops, roomy or fitted, etc. Like I said on Rav: Gorgeous! I know these shorts are a bit off the beaten path, and I think that's why I love seeing the FO's so much! You look great, and I hope you get much wear out of them! Thanks, Katie. They are unusual, but aren't you proud that you thought up something so unique and awesome? After successfully knitting these and wearing them, I feel like there's no project I can't tackle. Most definitely. And I would be lying if I said I didn't choose those cables to be an extreme challenge! I'm glad you enjoyed them, and were empowered! Thanks, Elena, but don't diss your legs! I have cellulite, spider veins, stretch marks and muffin top. I regret how dark these photos are now, because it masks a good deal of that. It was just so hard to get a bright, non blurry photo on that dreary day without anyone to help me. I try to take care of my body and, beyond that, accept that the way I am now is how I'm meant to be. I was determined to make these shorts no matter how I looked in them. My only concern was fit. Besides, Elena, a capoeirista's legs are nothing to hide!!! I love these Michelle, they look fantastic on you!!!! And I really love the photos!!! Thanks! It was so hurried and dark that afternoon. I took so many blurry photos, but finally salvaged these. Hehe, capoeirista's legs, true. They are getting thicker and thicker. I'm just adding muscle, but they are getting BIG. They look so fantastic on you! Just one skein of yarn, huh? Thanks, Stephanie, and yes just one skein. I made a medium with longer legs and the same yarn used for one of the samples was knit into a large with shorter legs- still one skein. Shorts can be both comfortable and fashionable in any style or color and this is really a unique collection in women's shorts fashion.